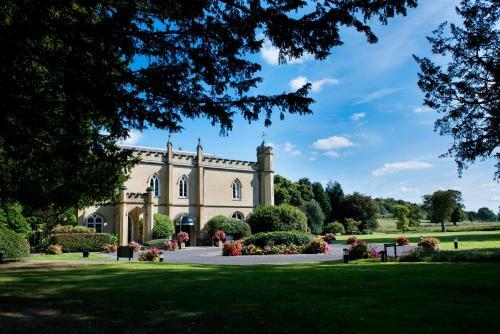 With free parking, Missenden Abbey has easy access to the M40, M4, and M25 motorways. Amersham and Chesham is less than 15 minutes' drive away. This deeply historic building goes all the way back to 1133 - the year that also saw the construction of Exeter and Durham Cathedral. This magnificent property is enclosed by over 10 acres of dreamy Chiltern countryside in the picturesque village of Great Missenden. In terms of location it is difficult to beat. The A143 links directly to the M25 and M40 and gets on the M1 motorway in no time at all. There's also some great little towns and villages nearby including Amersham, Chesham and Aylesbury. The hotel's position amongst the Chiltern Hills makes it popular with ramblers and those embarking on The Chiltern Heritage Trail. There's much to enjoy here. Missenden Abbey's grounds are ideal for croquet, ball games and a round of pitch and putt. Each of the 57 bedrooms feature an en suite shower, flatscreen satellite TV, free Wi-Fi and tea and coffee making facilities. There are a range of dining experiences available and tables can be reserved on any day of the week in the restaurant. Missenden Abbey was once the home of the world-famous children's author, Roald Dahl. Great Missenden benefits from a direct train link to London from Marylebone Station.